Services: Morning Service at 10.45, occasional evening services at 6.30. Refreshments after the service. Weddings, baptisms, etc by arrangement. summer holidays. Every Thursday starting Thursday 28th July. 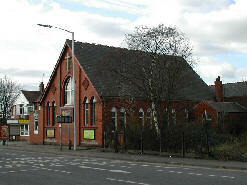 The church supports through individual donations in money and in kind the work of "Barnabus" with the homeless of Manchester, the Methodist children's charity Action for Children including through League of Light boxes, The Salvation Army work with the homeless and disadvantaged and the work of "Compassion" sponsoring chidren in developing countries. Also Operation Christmas Child is supported through the Brownies and Rainbows. Through Churches Together in Swinton and Pendlebury the church supports the work of Action by Christians against Torture (ACAT) by sending Christmas Cards to political prisoners. In addition a member of the church is the current representative of the Circuit on the board of Ordsall Community Cafe which was set up by Churches Together in Ordsall including our Salford Circuit with the involvement of our former Deacon Kate Barrett. The minister and several of the members are involved in "Walk to Emmaus", part of the three day Cursillio movement.